Author Kevin Christofora announces debut and reading of his newest book in the Hometown All Stars series of children’s baseball books at the American Association of School Librarians (AASL) Authorpalooza. 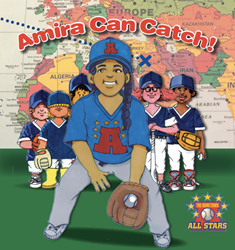 ‘Amira Can Catch’ teaches children inclusivity and acceptance through the story of Amira, a Syrian refugee who joins the team. Kevin Christofora announces debut and reading of his newest book in the Hometown All Stars series of children’s baseball books at the American Association of School Librarians (AASL) Authorpalooza. Amira Can Catch is all about inclusivity and acceptance. I can't think of a better message to share with the audience at the American Association of School Librarians, or with my readers and their families in general. Author Kevin Christofora, of the Hometown All-Stars Series of children’s baseball books, will be debuting and reading his new book, Amira Can Catch, at the American Association of School Librarians (AASL) National Conference. The Hometown All Stars series teaches children important lessons through the lens of a Little League team. The newest installment in the children’s book series, Amira Can Catch, tells the story of Amira, a new student, who also happens to be a Syrian refugee. When: Christofora will be reading Amira Can Catch on November 9, 2017 at 5:00 p.m., with a signing to follow from 5:30 p.m. to 6 p.m. Distributed by Midpoint Books, “The Hometown All Stars” series is currently available on Amazon, as well as thehometownallstars.com. Amira Can Catch will be available at the AASL Authorpalooza. Christofora, a father and little league coach, hopes his books will inspire children to play outside more often. A devotee of America's pastime, he aims to teach young people about baseball and the habits of a healthy lifestyle in the form of a fun and educational bedtime story. He has appeared on ABC News, ESPN Radio, 660 News Radio, Santa Fe - KVSF 101.5, and WDST-FM Woodstock, and has had articles featured in About Families Online, KidzEdge, Mom Blog Society, and several other publications.